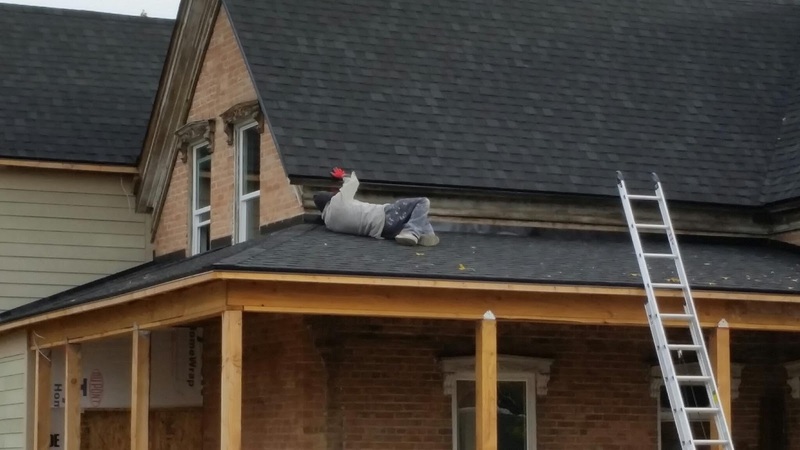 That is a painter laying on the porch cleaning up the existing soffit and fascia to get it ready for paint. To which I say, "Woohoo!" 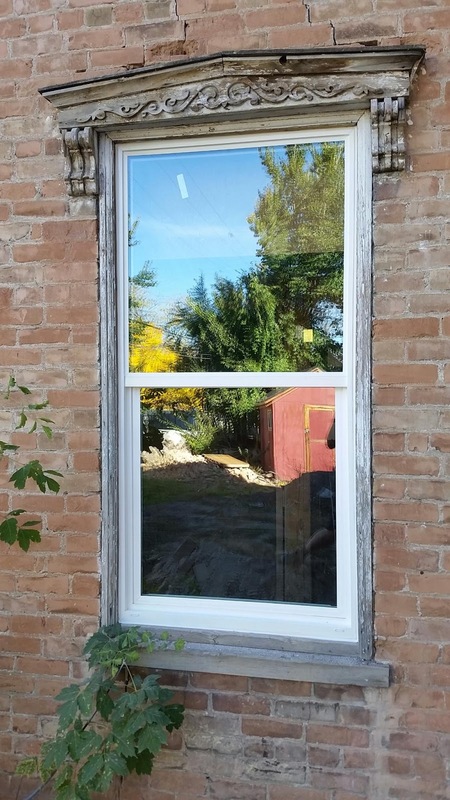 See this window here? It is in the hallway that leads into the office and downstairs bathroom. 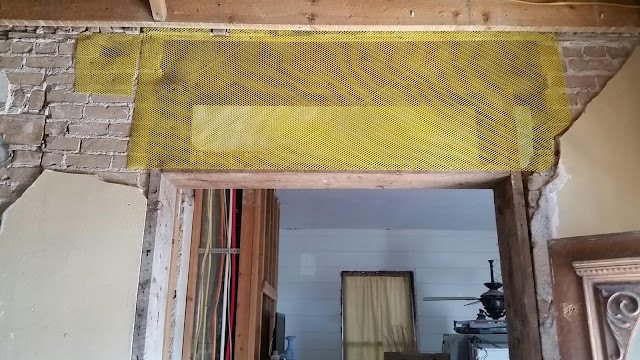 You might notice that it is partially covered up. That happened when we rebuilt the stairs years ago. The original stairs were crazy steep, so to adjust them to a comfortable angle, we had to bisect the window. There has always been about a foot of window sticking up on the landing in the stairwell. 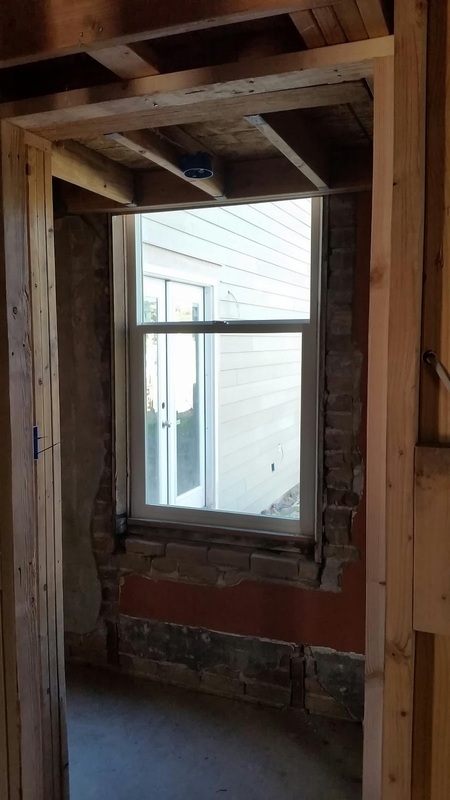 We always planned to just take the window out and brick it up, but then we changed our minds. It is nice to have a little natural light in the area, and it would have looked so weird from the outside to have the window gone. So it is going to stay there, partially covered up, forever and ever. Lani the Builder built a little wall in front of it up on the top half so that you can't see the window from the stairway. And here is how it looks from the outside. You almost can't tell. It will be obvious at night when the lights are on, but I think it is something we can all live with. 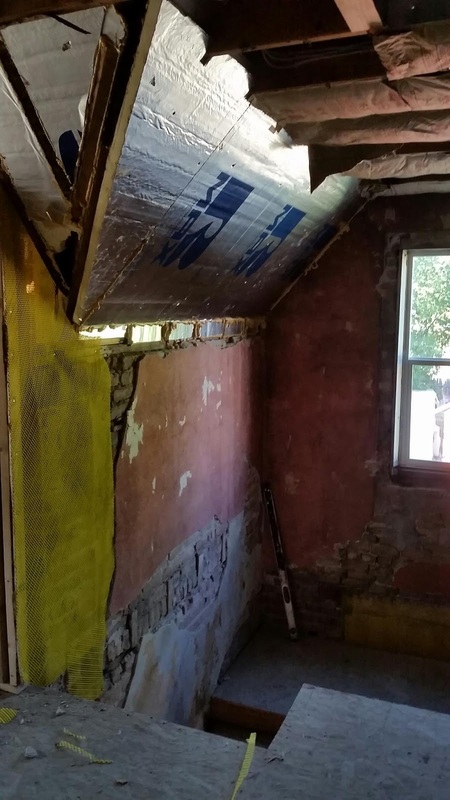 He said he would rather patch the plaster on the existing walls than pull off all the plaster and do drywall, so we said Knock Yourself Out. That yellow mesh is there for the plaster to adhere to. I think he had planned to start plastering right away, but then decided to go back to working outside while the weather was nice. And in insulation news, apparently the insulation guys got in a bad shipment of Urethane Foam. They are now waiting for a replacement shipment, but it has put them behind schedule by about 6 days. So they will insulate our house sometime next week. In other news, last night we carved pumpkins. 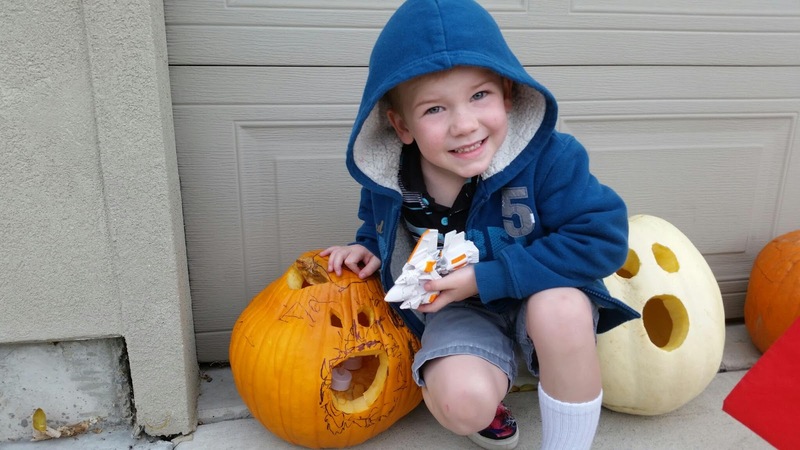 The boys always draw faces on the pumpkins and we carved them out for him. Here is Colin's. He really had a good time with the sharpie. 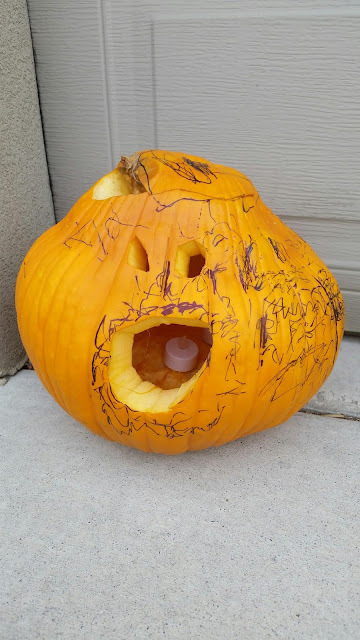 There was clearly two eyes and a nose and then almost endless scribbles around the pumpkin. It is usually understood that where he draws lines, that is where I cut. So when I hestitated before stabbing it he kindly told me, "You can just cut out the face if you like." AND, this is just for you Susanne. 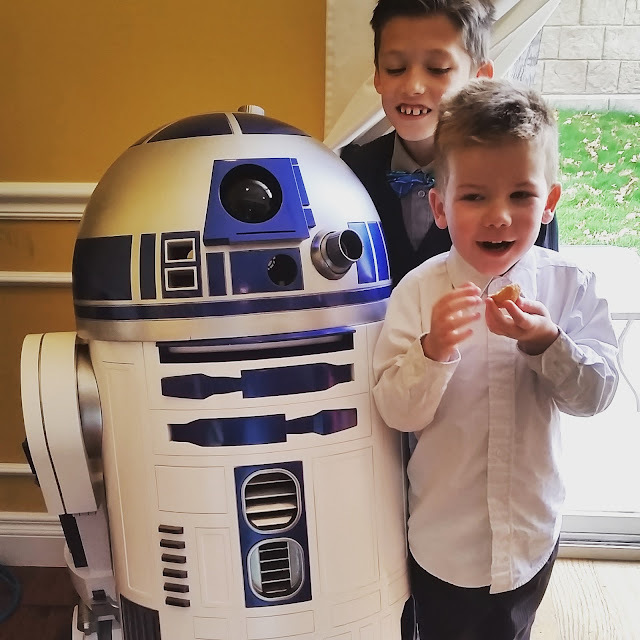 Here is a picture of R2-D2, 3-D printed, assembled and painted by Boydell. And maybe Lance.